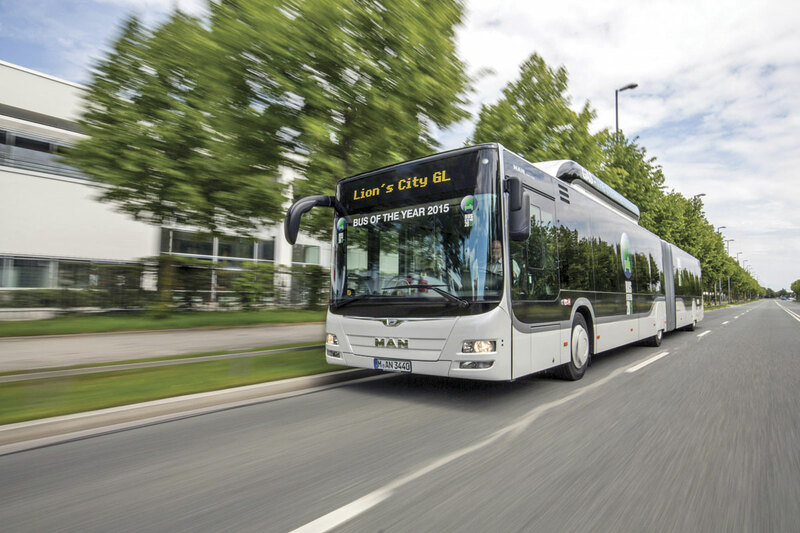 The International Bus & Coach of the Year jury, consisting of jury members from 20 of Europe’s leading bus and coach trade magazines, has voted the MAN Lion’s City GL CNG the Bus of the Year 2015. 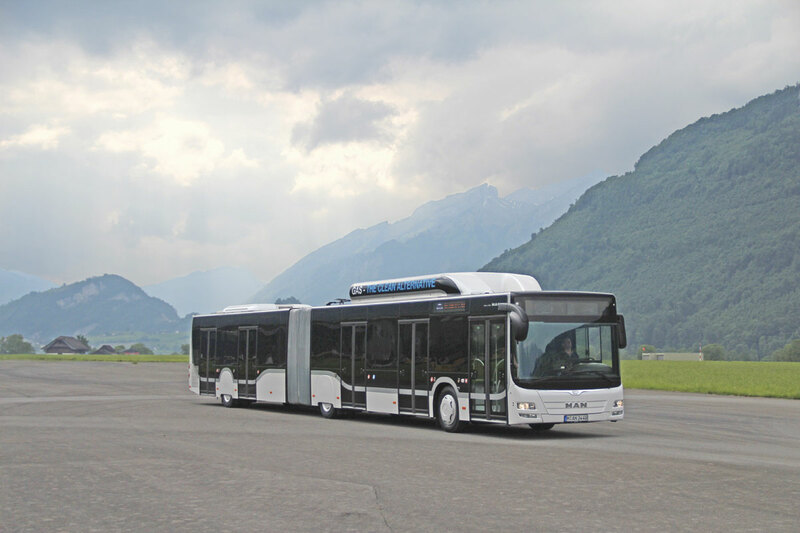 The award follows thorough testing of the five candidates at the BusEuroTest 2014 event held in Lucerne, Switzerland in June (see Issue 1289, 15 August 2014). It is the first time a bus powered by anything other than diesel alone has won the title. 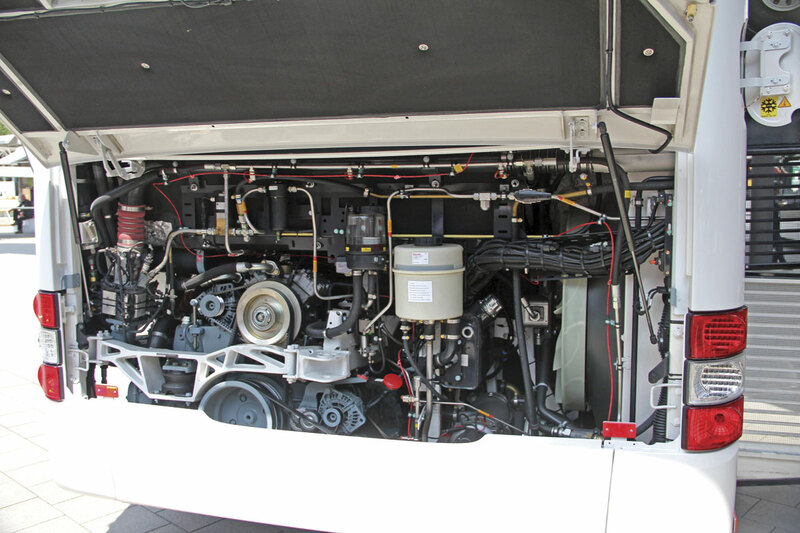 Providing the power in the winning bus was MAN’s 12.816-litre E2876 LUH07 CNG engine, a six-cylinder unit with turbocharging, intercooling and a three way catalytic converter which can operate on CNG, biogas or synthetic gas. It develops 310hp (228kW) at 2,000rpm and maximum torque of 1,250Nm at 1,000-1,700rpm. Service intervals on the unit are 18,641 miles (30,000km). In addition to encapsulation, the use of spark plugs to control combustion helps to make it very quiet in operation. To meet Euro6 the exhaust goes through a three-way OxyCat catalytic converter with lambda control. This was described as a ‘fit and forget’ system. No additives such as AdBlue are required and there was no particulate filter, contributing to the promise that the CNG engine option would require less maintenance than a diesel. The gearbox was Voith’s D864.5 four-speed automatic with SensoTop control and integrated retarder. Running on fully synthetic gearbox oil, it has an oil change interval of 112,000miles (180,000km). The drive axle was a version of the ZF AV-132 portal unit that the two manufacturers developed with a final drive ratio of 1:5.74, and both the front and centre axles were rigid units. All three were air suspended and mounted on Continental 275/70R 22.5 Urban HA3 M+S tyres. Other elements of the mechanical specification include ZF Servocom 8098 hydraulic power steering; an ECAS electronically controlled air suspension system with nearside kneeling; and electronically operated disc brakes with ABS and switchable ASR. Eight 205-litre composite aluminium tanks mounted on the roof provide a total fuel capacity of 1,640-litres. MAN say that, based on 60,000km annually over ten years, the gas engine would potentially save 15% over the cost of running a diesel bus. It only needed an order for 15 CNG two-axle buses to make the installation of a refuelling station viable. It was working with the German company Erdgas Mobil, which would supply the necessary refuelling equipment on this basis. The vehicle participating in the BusEuroTest incorporated a great deal of experience that MAN has gained from its participation in the European Bus System of the Future (EBSF) project, in which it worked alongside the municipal operator in Budapest, Hungary. It was very attractively, if not entirely practically, finished with pink stanchions and handrails, light coloured flooring and white mouldings. Two ideas successfully trialled during this collaboration and incorporated in the bus were the idea of having five separate doors and also that of having folding seats that can be locked out of use during peak travel periods to provide additional standing room. Independent research cited by MAN shows a ten second reduction to 16 seconds in the time taken to board 40 passengers compared with only one doorway less. Boarding passengers press the button to open the relevant door apart from the first door, which the driver controls. All five doors close at the press of one button. The Lion’s City is only 2.50m wide rather than 2.55m though you do not get this impression when looking at it or travelling on it. Interior headroom is 2,328mm. 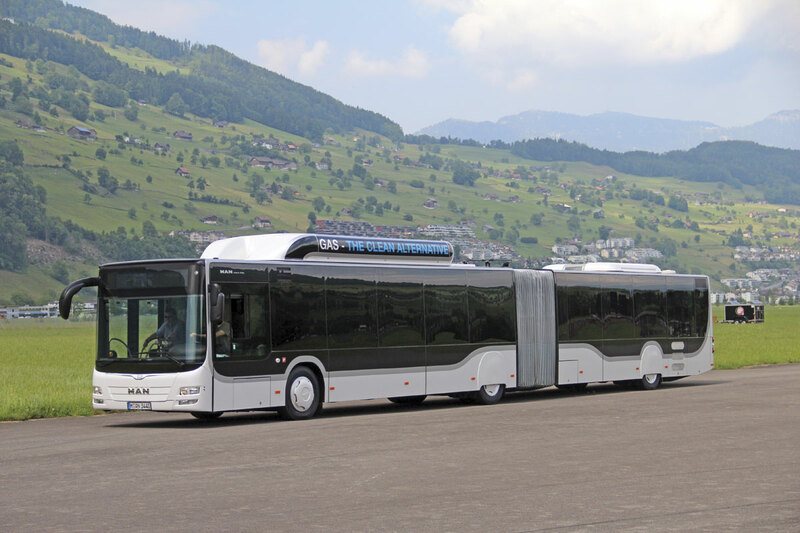 The articulation unit on the bus participating in the BusEuroTest was the optional transparent unit by Hemscheidt, based in Kassel. The standard unit is supplied by the same company. 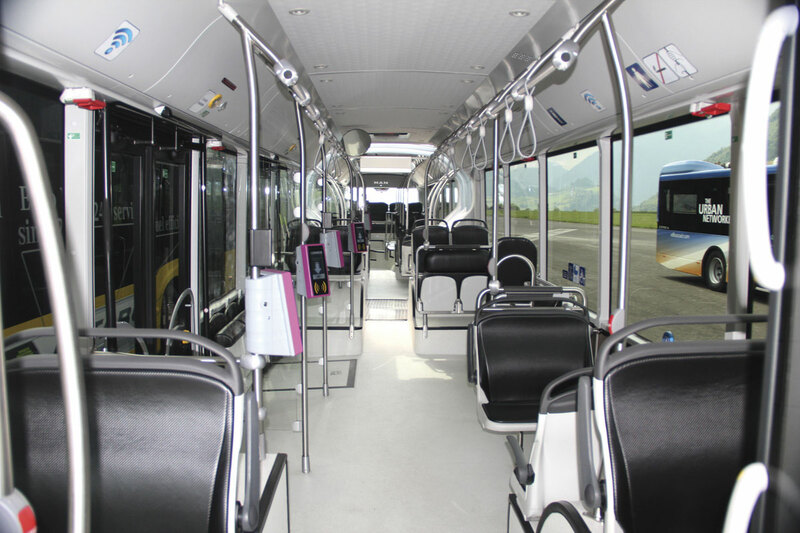 Though there are cleaning issues and considerable additional expense involved in their specification, these transparent units not only brighten what is often a really dark area of an articulated bus, they give a flow to the whole vehicle, encouraging passengers to travel within the articulation section and thereby making the utilisation of the available space easier. Other aspects of the specification included the incorporation of a wi-fi hotspot and tyre pressure monitoring on all three axles. Three electrically operated glazed emergency roof hatches were fitted, each with rain sensors to facilitate their closure in inclement weather. Automatic fire surpression equipment in the engine bay is standard. 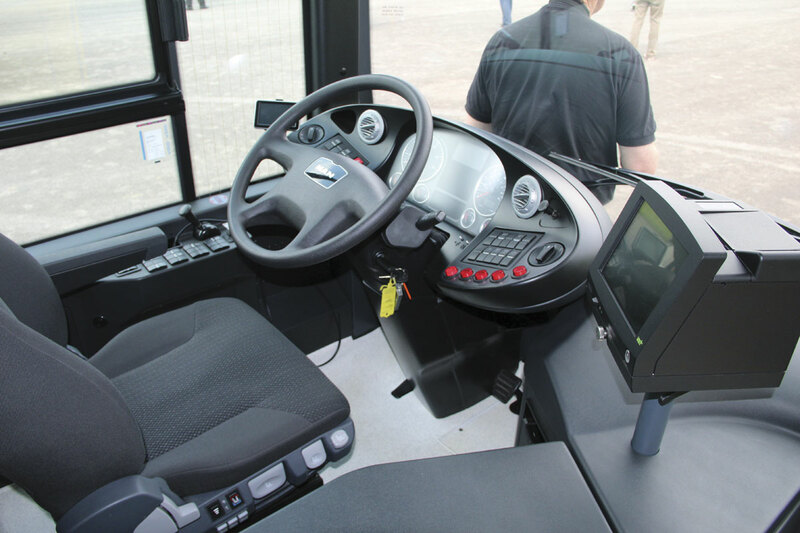 Driving the bus was a very positive experience for jury members, who found the cab comfortable and well laid out, despite a low driving position, with easily controlled performance. It accelerated well and the retarder braked steplessly. Despite the 18,750m length being the maximum permitted in Europe on three axles, the turning circle quoted by MAN was only 24,428mm. 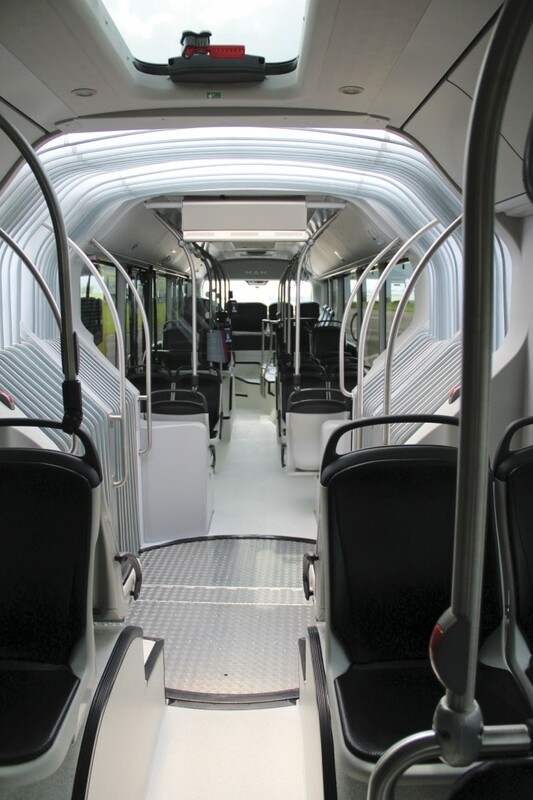 The fully MAN built Lion’s City range is not available in the UK but buses featuring CNG technology are offered utilising coachwork from Salvador Caetano incorporating MAN front and rear styling. Marketed under the EcoCity banner, Arriva has 12m Euro5 EEV examples running in Runcorn and Darlington, while Go-Ahead’s Anglian subsidiary has a batch running from its base in Beccles. These feature the earlier E2876 LUH 04 engine rated at 310hp (228kW) and developing torque of 1.050Nm. No Euro6 examples are yet running in the UK but I understand a demonstrator will be available at some stage in the coming months. The UK is not wholly won over to the idea of CNG power yet, and to a considerable degree the same is true in Europe though in both there are convincing economic arguments in its favour coupled with the environmental ones in terms of both emissions and noise. For this reason it is unlikely Governments will significantly alter taxation regimes to an extent that this financial advantage will be lost. 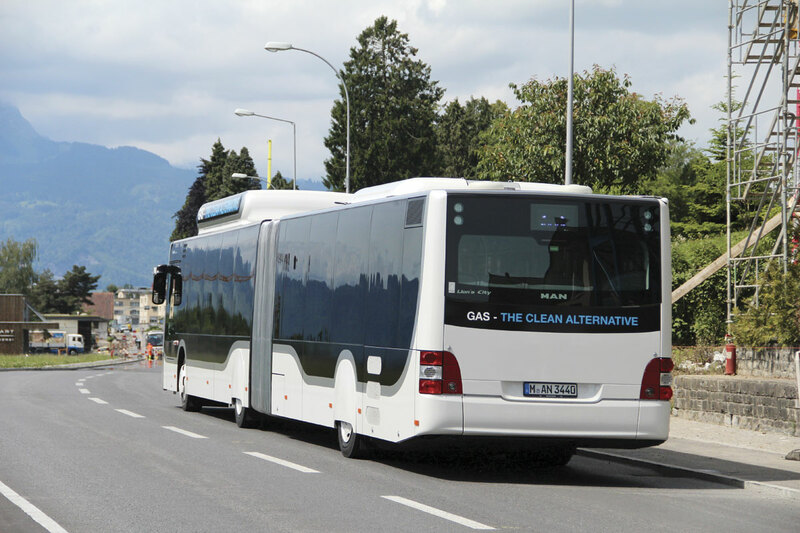 Franz Freiherr von Redwitz, Head of Product Marketing Bus & Coach at MAN Truck & Bus, said gas would be available on the market for at least the next 20 years because of fracking and the only exhaust was CO2. It was possible to take CO2 levels to those of electric if fuel came from sustainable sources such as biogas or e-gas using available technology. He went on to say that students at Zurich University had developed the technology to extract CO2 from environmental air. If that was used to make methane, as it now could be, then there could be a complete CO2 neutral cycle. If this came to fruition, ‘That’s going to change the world’ he said.